Some good news for those individuals in the Philippines with the fact that carNAVi is updating their Reuse and Recycling program, which allows carNAVi product owners to exchange the item in return for a gift voucher that can be used to purchase carNAVi goods at the carNAVi Store online. 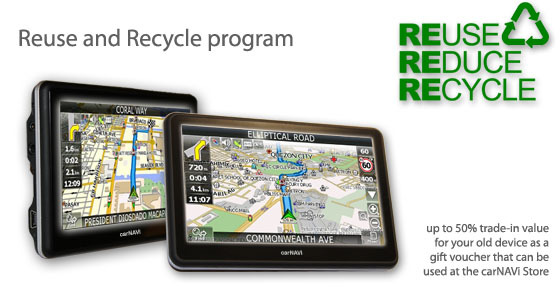 The program covers carNAVi GPS navigation devices but not accessories. The program works in exactly the same way as other recycling and trade-in programs, which is to take details about the model and condition of the product and then produce a value based on that information. The estimated return value, which can be up to 50% of the current retail price for the particular unit, heavily dependents on the condition of the device, things like cosmetic damage, wear and tear or possible water damage would more than likely significantly reduce that estimated gift voucher value.